It was during my trip to Pune in 2012 that I was privileged to help with the medical classes that take place every day during the week from 4pm to 6pm. I had the privilege to work with Geetaji, sometimes with Guruji, Abhi and some of the most experienced yoga teachers at the Institute. I was asked to help a lady with a broken pelvis. It turned out that she is an English Iyengar yoga teacher who lives in Portugal. Her name is Catharine O'Neill. In the summer of 2005 Catharine fell out of a first floor window in Normandy fracturing her right pelvis and her right elbow. The injuries sustained were life changing. She made a good recovery by obeying the doctors and having some help from a physiotherapist and gradually by returning to her beloved yoga by taking one to one yoga sessions with Corinne at the Paris Institute whilst she was still walking on crutches. Her problems were most notable in the area of the hips and groins causing all sorts of problems including in the knees. 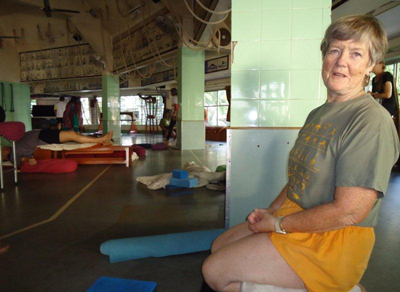 As an Iyengar Yoga teacher, Catharine decided to follow her recovery with the teachings of Guruji and Geetaji, so she booked herself for a month in Pune in October 2012 and was accepted into the medical classes. I am most grateful to Catharine for allowing me to help her with the program which Geetaji carefully planed to help her in her recovery, to Pandu, for allowing me to take pictures and most of all to the patience, wisdom and teaching of the Iyengars and the other teachers at the Institute in Pune. This pdf file shows some of the Asanas selected by Geeta for Catharine's specific medical condition (shown in no specific sequence), some of them accompanied by photographs. After a gap of 6 years from my last trip to Pune, it was finally time to go again. I am always happily surprised to find that the Institute in Pune manages to retain the same look and feel. I always feel very comfortable in the familiar surroundings with familiar faces. Most of all it remains a privilege to practice in the same room as Guruji. Early morning classes with Prashant are always a challenge with his unique stile. Geetaji was not teaching at this time so we had classes taught by Raj, Gulnaz and Abhi- with Guruji giving points of information if he noticed something in our practice needing improvement. Self practice from 9 to 12 always ended up with most of us looking and listening to Gurujis practice and his instructions to his senior Indian students. Avascular necrosis (AVN) is defined as cellular death of bone components due to interruption of the blood supply; the bone structures then collapse, resulting in bone destruction, pain, and loss of joint function. AVN is associated with numerous conditions and usually involves the epiphysis of long bones, such as the femoral and humeral heads and the femoral condyles, but small bones can also be affected. In clinical practice, AVN is most commonly encountered in the hip. Mr. Pramod, a gentleman in his early 50s is from Pune has the most common type, Necrosis of the hips with both hips affected. Prior to developing Necrosis Mr. Pramod had not practiced yoga asanas- his yoga practice was more focused on the practice of Pranayama for mental balance. As a young man he had been very active, playing Soccer when he was at college in his native town Solapur. He also did weight training and other fitness exercises. He developed Necrosis 10 years ago, when he started to get a crawling sensation from knee to hip initially in the right leg and then on both. His walking started to be more and more difficult to the point that he could not walk- by this stage placing his foot down felt as if a nail was being pushed through. The doctors did not know what the reason for this pain was and so their first suggestion was a hip replacement operation. Mr. Pramod was not ready for such a radical intervention given that there was no certainty that this was the cause of his pain. Doctors suggested x-rays, scans and blood tests. The blood test showed that his B12 levels were very low, which is one of the now proven reasons in the development of Necrosis. Injections of Vitamin B12 were prescribed with a recommended diet high in B12. Unfortunately no noticeable improvement was felt and so the last resort was to have radioactive injections. This led to the diagnosis of Avascular Necrosis. Once this formal diagnosed was made, the doctors insisted that Mr. Pramod have the hip replacement operation. However, he refused the operation and instead started to use Homoeopathic remedies in conjunction with balancing techniques and his daily practice of Bhastrika Pranayama (starting with 5 cycles and increasing to 80 cycles daily). This brought some relief but what really made a significant difference was when a friend suggested that he should go to the Ramamani Iyengar Memorial Yoga Institute (RIMY). Guruji looked into his medical history, x-rays, etc and then he suggested a range of asanas to be practiced every day. Since then Mr. Pradod has been visiting the Institute once per week where he practices the prescribed asanas under the guidance of Guruji and his assistances. Through continued practise his hips have improved significantly and after years of suffering a disability he now manages to walk and have a more or less normal life. This has also given him hope. 2. Sciatica due to weight lifting and gym exercises. Mrs. Anita Agarwal from Pune, a successful fashion designer, used to keep fit through regular visits to her local gym. Her job requires her to stand for long periods of time when she is designing her jewellery and fashion accessories. She often travels for work visiting factories and outlets across India which means that she can be sitting and inactive for long periods of time. When she was at home she felt that she had to do more exercise to help her keep fit. She decided to join her local gym where she was assured that she could lose lots of weight and keep fit at the same time and that this could be done without any danger to her health. A number of exercises including weight lifting were recommended. The exercises were not monitored or adapted to her needs. She was under the impression that she was doing the right thing until she started to notice that instead of feeling good after her sessions, a pain on her lower back was increasing to the point that she had to start taking pain killers and had to stop her visits to the gym completely. Anita knew she had to do something about the pain and as she did not want to take painkillers for the rest of her life. She decided to write to Guruji for help. She had herd about his reputation for helping people with this type of problem. The Medical classes at the Iyengar Yoga Institute were well known to give excellent results. The x-rays of her lower back spine showed deterioration and compression of the sciatica nerve. The combination of too much weight bearing and standing for long periods of time had made her life very uncomfortable and painful. It was now very difficult to have a normal life as she found she was not able to do her job without being in constant pain. Guruji recommended a list of asanas to be practiced at the Institute and at home. She told me that this was the best thing that she could have done for herself. Due to her work commitments she was not as constant with her practice as she would like to be but nonetheless she could still feel the benefits. Tinnitus is the perception of sound within the human ear in the absence of corresponding external sound. Tinnitus is not a disease, but a symptom that can result from a wide range of underlying causes: abnormally loud sounds in the ear canal for even the briefest period (but usually with some duration), ear infections, foreign objects in the ear, nose allergies that prevent (or induce) fluid drain, or wax build-up. Tinnitus can also be caused by natural hearing impairment (as in aging), as a side effect of some medications, and as a side effect of genetic (congenital) hearing loss. However, the most common cause is noise-induced hearing loss. Fernando Garcia Aguinaco is an Iyengar yoga teacher from Mexico and this was his first visit to RIMY. Fernando was observing the medical classes for some days and started to wonder if it was possible to be a “patient” for his long standing tinnitus. He was asked to write to Geetaji with his medical history and to his surprise two days later he was given a sequence for his condition to be practised during the medical classes. Fernando has suffered from tinnitus for a long time. Up until that time he was very happy to observe the medical classes but now he had the advantage of being able to fell the remedial benefits of the sequence that he was given. With the help of many of the Indian teachers that regularly help people he was put into some asanas that relieved the pressure to his ears. Asanas were modified to elongate his neck and to create space for his inner ears. I would like to comment that Guruji was present during most of the medical classes and he ensured that his instructions where followed carefully and with precision. Any information given here are not guidelines to teach or treat people with the above conditions as students are taught as individuals. The same condition may require slightly different approach and modifications as no two people are the same. I would like to give humble thanks to Guruji for passing so much knowledge to all his students so that we may in turn help others. I am in depth to Mr. Pramod, Anita Agarwal and Fernando for allowing me to take photos and to talk to me about their conditions. To Pandurang Rao (Pandu) for facilitating my participating and contributing during the medical classes, my gratitude also goes to many of the teachers at RYMI who teach the medical classes and were so patient in correcting and guiding me during all the sessions; my particular thanks go to Abhi, Motkar, Ajei, Chandra and Gulnaz. Also special thanks to Rose Alexander for reading and correcting this article. She is a dedicated Iyengar Yoga student.